He loves me, he loves me not…Alexis leaves a Valentine’s Day surprise for her crush. Does he like her back? 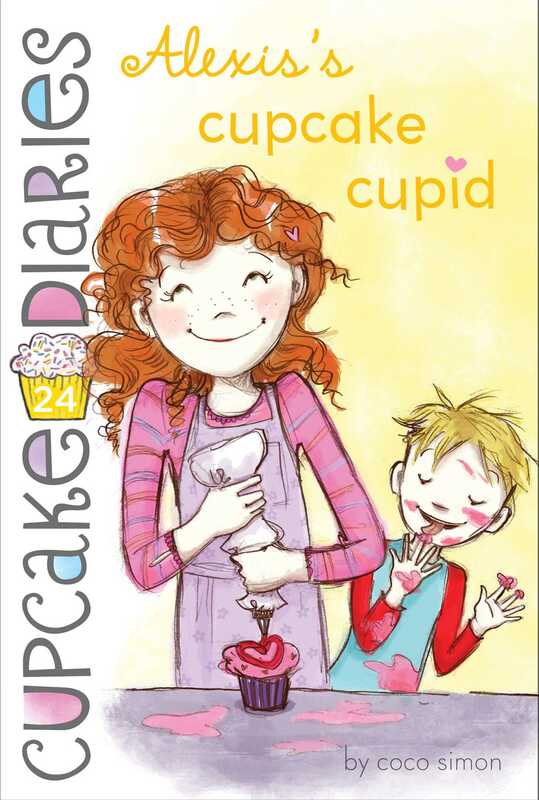 Despite objections from her Cupcake Club pals, Alexis makes a special valentine cupcake for her crush, Emma’s older brother Matt, and leaves it for him next to his computer. Alexis is secretly hoping Matt will get the hint and give her a valentine, too. But ever since Alexis left the cupcake, Matt’s been acting really uncomfortable around her. Does Matt want to be her valentine or doesn’t he? With no certain valentine in sight, Alexis ends up leaving a surprise valentine’s gift on Emma’s desk, because, after all, crushes may come and go, but BFFs are forever! “Red food coloring?” I continued. “Yay! Time to check out!” I said cheerfully. The plan today was to get supplies for our Valentine’s cupcakes, buy Valentine’s Day cards for our families, head back to Emma’s to whip up cupcakes, and then maybe a sleepover. But first we needed lunch. In the food court, a new Asian street-food place had just opened, and we had to check it out. Emma loves spicy Asian food, and so does Mia. Katie likes all types of cuisines, and I don’t like spicy food at all, but Emma and Mia begged us, so we agreed to try it. The menu was awesome, and it had so many choices: dumplings, both steamed and pan-fried; marinated skewers of chicken and beef; scallion pancakes loaded with barbecued pork; and noodles with shrimp and mushrooms, and every kind of topping you could imagine! I was dreading the Family Skating Party more than maybe I had ever dreaded anything. Clearly, I was alone in this. “Great food options with the Chinese theme, too. Much better than the Wild West theme last year,” said Emma. “I hate eating ribs in public. So messy.” She shook her head and laughed. The other girls laughed too, and I imagined chasing the butterflies in my stomach around with a net and then whacking them! “Alexis, is something wrong? You’re being very quiet,” Mia said. “Wait, I thought you were going to take lessons!” said Emma. I shook my head. “Didn’t have time. I still stink. I think I might not go.” I hated to miss a social opportunity where I might get to interact “in the real world” with Matt Taylor, Emma’s brother and the crush of my life. But that was the primary reason I wasn’t going. I couldn’t stand the idea of being mortified in front of Matt. What if he saw that I was a bad skater? He’s such a jock—he’d totally lose respect for me. “Wait, whaaaat? What do you mean you might not go? You have to go!” said Emma just as we reached the front of the line. We pooled our money and ordered a bunch of different stuff to mix and match and share. The place was really busy, and it only had these long communal tables, so while we waited for our food to be ready, we split up and got busy scouting for people who were leaving. Katie found a very tight spot for us after a few minutes, and Mia and Emma went to help save the seats while I returned to the counter to wait for our order. I saw my friend Ella Klinsky from school, and we waved and gestured to how crazy-busy the place was. Now that I was looking around, I could see that a lot of kids from school were here, sprinkled around. This Asian restaurant was popular with middle schoolers, that was for sure. I wondered how many of them could skate. I was lost in thought, holding the little buzzer that they give you to tell you when your food is ready, twirling it in my hands and thinking about Valentine’s Day. I know I am the no-nonsense type, but I am also kind of a sucker for all that romance stuff, believe it or not. I love the love songs on the radio, the romantic shows on TV, and my mom always decorates the table on Valentine’s Day morning for breakfast. We have heart-shaped pancakes, and she gives us cards and candy and a little pink or red present, like cute red socks or something. It’s a fun way to spice up blah old February, and I was looking forward to it. Suddenly, someone very close behind me said, “Lexi?” I jumped and whirled around. “Matt!” I cried. It was Matt Taylor, in the flesh! “Hi!” I felt myself blush hard (speaking of something red! ), but I couldn’t stop grinning. “Well, I don’t exactly expect people to sneak up behind me in places like this and then speak directly into my ear!” I said, as if I was annoyed, but really I was just the opposite—thrilled! I looked up at the menu, still smiling like a dope. “Well, we got . . .” And as I started to list our order, my buzzer went off, and I jumped again. “Hungry, maybe!” I said. I handed my buzzer to the girl at the counter, and she handed me our tray. I looked down at it, and my mouth began to water. My friends were waiting, my food was ready, but I didn’t want to leave. “Uh . . . where are you sitting?” I asked. “I haven’t found a spot yet. I’m solo. I’m sure I can just wedge in somewhere,” he said, all casual. It was almost his turn to order. “Well . . . come join us if you want. We can squeeze in,” I said, wincing inwardly. Our spot was tiny. But I would happily squeeze in for him. I said good-bye and went to my friends, lowering the heavy tray onto the table. “Hey, Em, Matt’s here,” I said, like it was totally normal and cool. “He has no one to eat with,” I said, doling out the food and perching on the end of the bench. I grimaced and took a bite of a dumpling. It was delicious, and for a few minutes of bliss, I forgot all about Matt and ice-skating. “This is insane! Sooooo yummy!” I moaned. We all traded containers and bites back and forth. Then I remembered about Matt, and I looked around. He had found a seat on his own near the end of another table. His back was to us and the seat across from him was empty. My heart clenched a little to see him eating all alone. I wanted to go join him, but I was nervous that my friends would get mad if I ditched them. Or worse, that if I went over there, someone would sit in the empty seat just as I reached it, and I’d be left standing there like a nerd—that would be so embarrassing. My palms began to sweat a little as I wrestled with the decision. Should I stay or should I go? I’d lost my appetite. The other girls began discussing what they were going to get at the stationery store, and I sort of followed along distractedly as I stared at Matt’s strong back and broad shoulders. I wondered if I should give him a valentine this year. The very thought made me feel sick to my stomach, but my dad always said you should do what you are afraid of doing, so maybe I should do it. Hmm. “Huh? What?” I said, snapping out of my daydream. “Oh. Uh . . . you know what? I’ll just meet you there in a few minutes, okay? I . . . have one more thing to do.” Did I really just lie to my friends for a boy? Bad, bad Alexis! But if they caught on, they didn’t seem to mind, and they didn’t ask any questions (and I didn’t offer any further explanation). We threw out our garbage—sorting everything into three cool-looking bins—one for food waste, one for paper stuff (which was most of it), and one for the few plastic cups and forks. Then they headed off and I doubled back to Matt’s table. Luckily, Matt had bought a lot of food, so he was only about two thirds of the way finished. “Hey,” I said, all casual. I laughed. “I won’t!” I put my hands to my mouth, like I was going to yell over to Panda Gardens, Hey, PG, time to pack it in! Matt told me his errand list as we stood up together and went to recycle/throw away his stuff. We found ourselves at the edge of the seating area, about to part ways. I was desperate to think of a way to prolong the encounter or to get him to touch my hands again, but I was distracted by his cuteness. My brain just wasn’t working fast enough. “Oh, cool. Okay. I’ll be back after my practice. My dad is taking me straight from here, so . . .” It actually seemed like he wasn’t ready to part yet either, which made me really psyched. “Well . . . ,” I stalled. He grabbed my hand and gave it a squeeze. “Lay off Panda Gardens!” he said with a smile, and then he quickly dropped my hand and walked away without looking back. I stood there grinning like an idiot. Then I whispered, “Thank you, Panda Gardens!” Promising myself to eat there sometime soon, I went to find my friends.